…and nose, and hands and tummy. …And actually, when it slips off the crust and hits the table – or your shirt – because it’s so darn fresh out of the brick oven… That’s how I have to start things off as I talk about two of my new favorite places in town. Yes, they’re both pizza places. (Don’t judge me.) Neither is gluten free (yet). But, both chefs are plucked from the south part of the boot, and they’re both upwards of Spaghetti Junction (fork tap!). The first is 850 Bar Pizza, tucked into the Crabapple development after a pretend build-out in West Midtown. Apparently there was drama, as there seems to have always been in that shopping center, but I don’t care – they chose the Northside as their permanent place of residence, and I am happy about it. They also chose an adorable, meatball of a chef who you just can’t help but love for his old-fashioned chef’s hat, tales of home in Naples Italy and just how enthusiastic he is about the food he’s cranking out of their open kitchen. His name is Stefano – and my husband and I hope to be friends with him one day. Like, real friends … who cook for each other. Perhaps the reason it sticks out so much in my pizza mind is the fact that the aforementioned chef suggested that I try a pizza off of the white list (guffaw). I’m a red sauce – extra, in fact – kind of girl. White pizza has no place on my palate. Had, until I took his advice and put my face into the Parma. 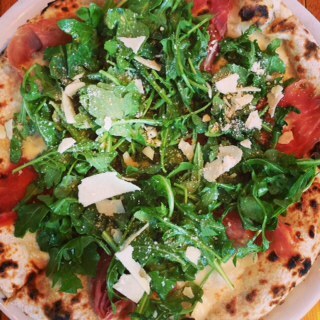 Oh my goodness – the warm pleasure mix of rich oil, tart arugula, salty proscuitto and fresh mozzarella just about did me in. I tried to eat the entire pie. And, I swore I would never eat anything else at 850 Bar. I had died and gone to Heaven. I did eat other things though. The other pies on the menu are just as outstanding. The mussels were drenched in a dreamy sauce and served with soft triangles of dough to make sure none of it got left behind. All of their ingredients come from Italy – from Naples, actually. Everything is hand-made behind the counter. It comes out hot, crisp and full of the kind of flavor that I’d have to say has been unmatched until now. The best part? This place is not that expensive, so it’s a perfect casual date night spot. It’s got a superb spirits menu, so it’s worth booking a table for to celebrate something, and their live music selection on a wide-open patio makes it the perfect solution to an I-just-don’t-want-to-cook night. Go there. Eat. Enjoy. Also… see my mini review in this month’s issue of Points North Atlanta here. The second stop on your Northside pizza tour should be in Roswell, at the latest establishment from the FH Food Trading Group, Real Fix Pizzeria. The name offers a reason to chuckle, sure. But, the pizza leaves no room (literally) for anything but finger-licking, napkin wadding, check-your-teeth before you leave kind of eating. When I sat down at my table along the wall lit by fun, old-fashioned light bulb signs, I had no idea that it’d be the only time I would let fresh food in my brand new car (had to leave the windows down for a week), or a reason to eat gluten-rich meals twice in a row. Yes, it was almost as good as leftovers. The 8 dishes that came out were like a joke – a good joke. 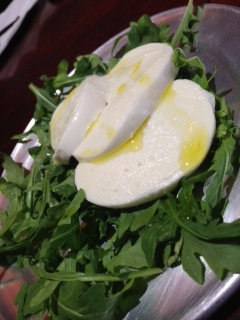 The teased us by warming up our palates with fresh-made mozzarella from Chef Giacomo Lazzano (from Palermo, and still speaking Palermonian). 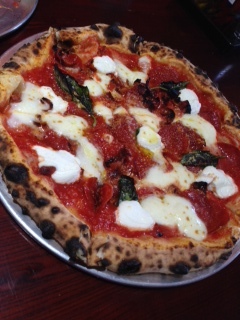 The following pies included The traditional pepperoni – except with bacon – called the Fugheddaboudit, a pistachio-laden pie called Get Crackin’ and the Fifth Avenue, which made me revel in memories of the aforementioned white pizza. We tried almost every pizza on the menu, and never looked back. Even the fried pizza was something I’d order again, maybe maybe on a solo pie kind of day. After lunch (does 8 pizzas count as lunch?) and a long chat with Chef L and his translating wife about Mother Dough and, we crammed as many of their sugared doughnut bites as we could fit into our bellies, not wanting one crumb to go to waste, or go untried. Everything was good. The service, the atmosphere, obviously the smell and as I mentioned, the leftovers. It’s a must-stop for lunch on the go, but it’s also a place for lounging, drinking and laughing over as many pies as you can stomach. It’s the perfect blend of culture, culinary respect and just plain good food. Gluten-induced headache or not, I’ll be going back.